Good To Begin Well, Better To End Well: The Sixth Annual No Kiss Blogfest is Here! And I've brought Thor and Eve to the party for your enjoyment! A fabulous almost kiss from BEYOND FATE -- which is available for your reading pleasure, along with the rest of the Fate of the Gods trilogy, now COMPLETE! Thanks so much to Amanda Byrne for hosting the event this year! She considered the bed again, and Thor swallowed against the absent thought that rose in her mind, of how much more easily they might share it than the bed in her dorm. And then her gaze caught on the table beside it, and Thor smiled, watching the play of emotion as it spilled into her aura. Surprise so intense it bordered upon shock, and then, as her fingers closed upon the ivory bracelet he had left there, wonder and delight. He allowed himself to enter the room, then, and stand at her side. The better to see her face. “It looks exactly the same,” she said, her fingers tracing the vines he had carved and filled with gold so carefully. The blisters had been worth it, to see the way her eyes had lit. A bridal gift fit for a chieftain’s daughter. Fit for a goddess. “Thor, this is…” She shook her head, her gaze falling back to the bracelet, and he smiled. Wordlessly, he took it from her, then slipped it over her hand and onto her wrist. When she lifted her face, her eyes searching his, he tucked a soft curl behind her ear. He searched her eyes, drinking in this moment. She was his Tora, his Eve in a way she hadn’t been in centuries, and this time, he would not make the same mistakes. “So many times, I’ve wondered what our lives would have been if I had trusted you in that life with my secrets, as you trusted me with yours. I wish I had told you everything. I wish I had truly stolen you away, as you asked, taken you all the way to Asgard when we left that beach. But I was too afraid you would turn from me if you knew me for a god. And I was too selfish to risk the truth, to risk losing you. He lowered his head, resting his forehead against hers. She made a soft sound, pleasure and desire mixed together, and her eyes closed. Their noses brushed, her breath against his lips, making him ache, and the scent of sunlight on her skin, of summer and cream, filling his head. He wanted to kiss her. He wanted to do more than kiss her. He wanted to remind her, body and soul, of everything they had shared together, every gift of love they had given to one another. But he did not dare. She was still so fragile, and when she was ready, when she knew her own mind, she would come to him. She would ask it of him. He let his hand fall from beneath hers, rubbing the memory of her skin, rose-petal soft, from his fingertips, and stepped back. Eve let out a breath, her cheeks flushed and her eyes half-dazed with need, naked and hungry. When she looked at him that way—he clenched his jaw against his own desire and left her, before he changed his mind. Don't forget to visit the other participants and get your fill of Almost Kisses to start your new year off right! Oh gulp. He should have just kissed her already. He's too honorable. :P To his detriment at times!! That was lovely, Amalia! Well-layered, sweet and hot! 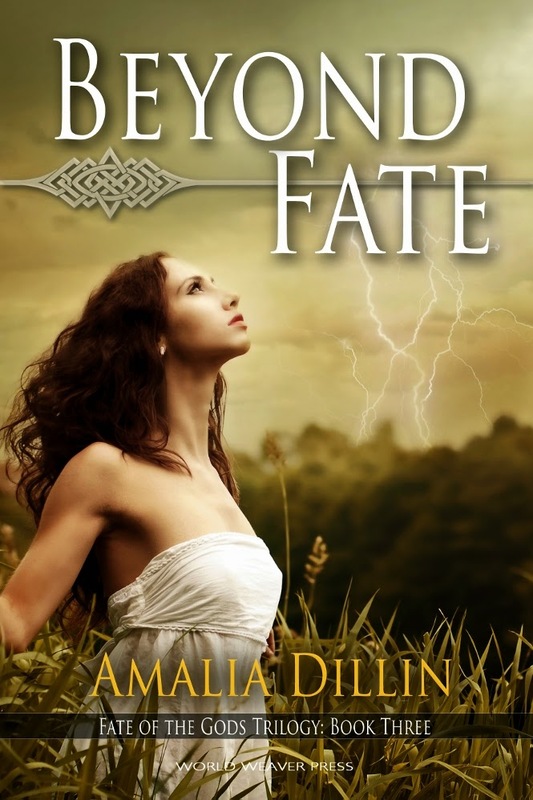 I love Beyond Fate's cover! Thanks so much!! World Weaver Press did a great job with all my Fate of the Gods covers! I'm glad you enjoyed my scene! Thanks for swinging by! Oh, I adore this. I can absolutely feel the love and desire between them. Very nice! Love the cover too. Ha! Yes. Definitely a gentleman -- and I don't disagree that sometimes he is a little bit TOO restrained when it comes to Eve! Thanks for hosting! And thanks for your comment! Lovely scene, Amalia! The tension's perfect. Thanks, Jami! Glad you enjoyed it! This is wonderful and you are wicked.